Heavy clouds have been threatening for the past few hours and finally at lunchtime in Taupo the sky’s opened up and we finally have some decent rain. Rain is important for our fishery as it will push a few fish into the rivers at this time of year but the strong wind which we also received this morning is also a key element to a heavy run of trout into all rivers. Anglers should enjoy some good fishing over the next few days as there are quite a few fish which will be busting to get into the rivers as it has been so dry for so long causing drastically low conditions for some rivers such as the TT and Hine. These two rivers should beÂ observed closely as fish will be moving in here overnight but may move quite quickly through the lowerÂ sections which are fishable to anglers. If you do find fish in these rivers and you manage to catch a run expect good numbers as they wont have run in singles- the key is to be out early!! The angling pressure on the Tongariro this week has been very quiet considering , this may be a result of some reports of hard fishing and clear conditions. 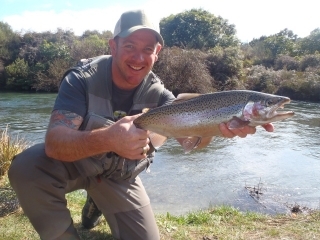 I must admit things are not easy but with the right attitude, right gear and early approach you will catch trout. 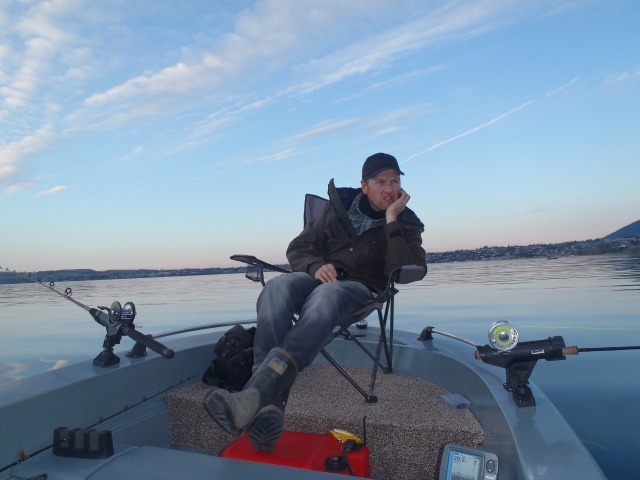 Give yourself the best chance by getting on the water when theÂ sun is dullÂ or you have cloud cover as fishing can really change quickly with the bright days. Â Some anglers which were fishing the Tongariro this week could have thought the river level was fluctuating but it was just my client getting in and out of theÂ water as he had size #17 feet!!!! 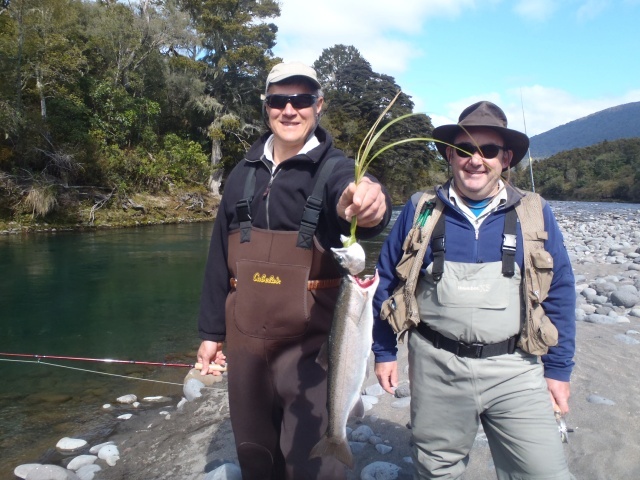 IÂ was guiding Sean and Simmen which were here with three other mates on their annual fishing trip from Australia. The first day we had a very late start and did not get on the water till 8 30 which was simply to late in bright sunny conditions with a low river. We had quite a frustrating day of spotting plenty of trout in the upper river but only managed to hook two fish for the day in which one was landed. The fence pool was spectacular as usual and the scenery just stunning but the 16 fish we counted which were holding deep in the middle of the pool were just not going to get caught. Quite often when fish arrive this high they will bunch together and make good numbers but they simply only have one thing on the mind and become very hard to get a take from. Simmen is fairly new to fishing and had never seen trout sitting in a pool and was struggling to accept that sometimes just because you can see them does not mean they will be caught. The second morning I was rudely woken by the alarm clock which was set at 4 30am as I was determined to get the guys on the water at first light and prove to them that this was a sure way to get hooked up and into good numbers of trout. I felt I had a bit of work to catch up on from the day before but all was forgotten when Simmen had hooked 4 or 5 before 7am and Sean had also secured one on the bank. Happy faces and smiles were back with the team as we headed back to the lodge for breakfast passing anglers which were getting on the water as we were heading home-a point proven, start early!!! The boys treated me with a fantastic cooked breakfast with bacon, eggs, tomato, toast and some really good coffee-amazing what a few fish can do. The rest of the troops arrived home shortly after us with a couple of fresh fish also taken from down river. 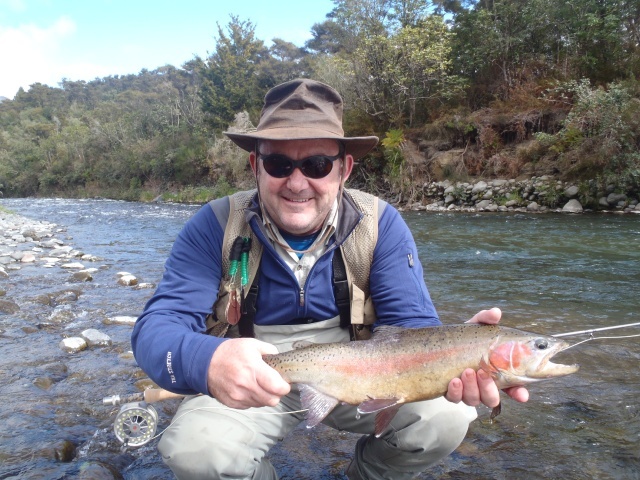 Sean and simmen were nymphing but the rest were having good fishing whileÂ swinging small wets with sinking lines. Wet line or streamer fishing is making a huge come back and anglers are once again realizing how good it actually can be.Â In all honestlyÂ I think that a good fisherman with small wets can actually be more stealthy than the nymph fisherman as he can swing it down to them instead of casting over them all the time-especially in clear lowÂ conditions. We continued mid morning and into the afternoon fishing around the middle reaches whichÂ luckily also produced fish in every pool bringing our daily tally to 9 fish. Our most productive water for the two daysÂ was the braids early, NeverÂ Fails, StagÂ and the Upper Birch where many fish could be seen while standing high on the bank. The Upper Birch is another pool which has improved over the past few months and can be easily fished from the hatchery side which has in the past has only been a pool forÂ anglers withÂ a long cast and heaps of split shot. After two days in quite warm conditions with lots of walking it was nice to reflect with a couple of cold brews on the deck with the guys-thanks for a great couple of days guys and see you next year. I feel sure that the rain we are getting will send some fish into the rivers depending on how long it goes for and will beÂ far bigger runs than what some are expecting with the flushing of the Potou canal next weekend. Â In my experience natural fresh rain is far better than the old water that they release down the river every year-somehow troutÂ know the difference.